What is Glyco-Flex Classic - 600mg? 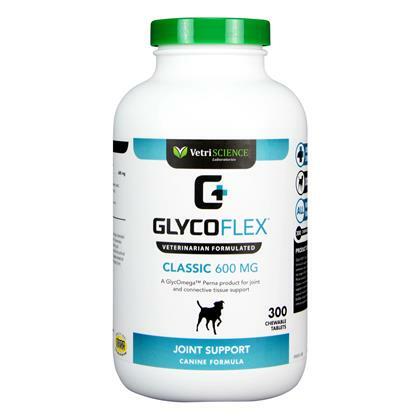 Glyco-Flex Classic - 600 mg is intended for use in dogs and is for maintaining healthy joints and connective tissue health. Glyco-Flex Classic - 600mg is a non-prescription (OTC) product available in bottles of 120 tablets and 300 tablets. 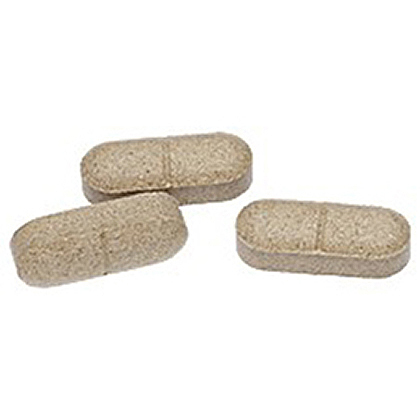 The usual dose of Glyco-Flex Classic - 600mg for the first 4-6 weeks in dogs up to 30 lbs is 1 tablet. For dogs 31-60 lbs use 2 tablets and for dogs 61-100 lbs use 3 tablets and 101 lbs and over use 4 tablets. The maintenance dose for dogs up to 30 lbs is 1/2 tablet, for dogs 31-60 lbs is 1 tablet and for dogs 61-100 lbs is 2 tablets and for dogs 101 lbs and over is 3 tablets. If giving more than 1 tablet divide between AM and PM. This product is for animal use in dogs only. Safe use in pregnant animals or animals intended for breeding has not been proven. Give during or after your pet has eaten to reduce incidence of gastrointestinal upset. Glyco-Flex Classic - 600mg can be given with or without food. Glyco-Flex Classic - 600mg is for dogs only. Do not give to cats. If giving more than 1 tablet divide between AM and PM. Other Ingredients: Alfalfa, brewers yeast, cellulose, silicon dioxide, stearic acid.